Join us for a tour of the Glassell School of Art! 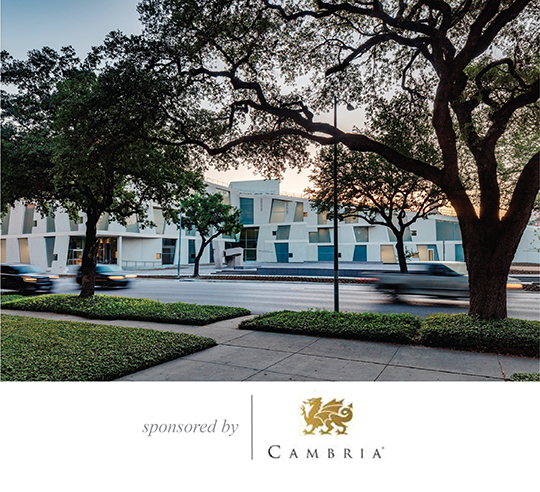 We'll tour the Glassell School building, including studio spaces and sculpture garden, then enjoy a happy hour and free admission to the Museum of Fine Arts. Joseph Havel has directed the Core Program since 1991 and was appointed director of the Glassell School of Art in 1993. His sculpture has been exhibited extensively throughout the U.S. and Europe, including solo museum shows at the Laumeier Sculpture Park, St. Louis; the Museum of Fine Arts, Houston; Palais de Tokyo, Paris; the Center for Contemporary Art, Kiev; the Huntington Beach Art Center, California; and the Dallas Contemporary. He has had solo gallery exhibitions at Yvon Lambert, New York; Hiram Butler Gallery, Houston; Galerie Gabrielle Maubrie, Paris; and Talley Dunn Gallery, Dallas. His work is in public collections in the U.S. and abroad, including the Whitney Museum, New York; the Modern Museum of Fort Worth; the Pompidou Center, Paris; the Ministry of Culture, Paris; the Menil Collection, Houston; and the Museum of Fine Arts, Houston. Havel has received numerous awards, including a National Endowment for the Arts Fellowship in 1987, a Louis Comfort Tiffany Fellowship in 1995, an Artadia Award in 2004, and the Dallas Contemporary Texas Legend Award in 2008. He was the Art League Houston’s Texas Artist of the Year in 2010 and the 2013 Texas Visual Artist as recognized by the Texas Legislature and the Texas Commission on the Arts.